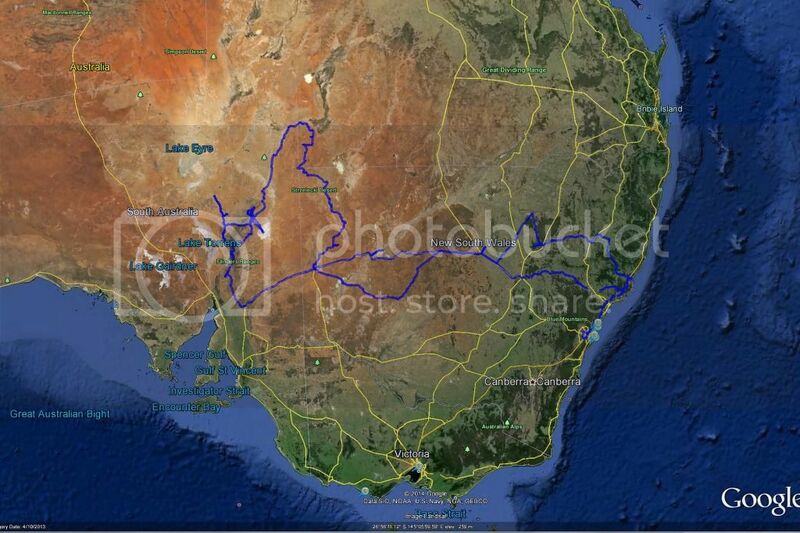 This is a test of linking a Google Earth track .kmz file. Below is the URL of a track I did on the weekend. I have talked to Matt and he suggested we try this way. If anyone else knows a better way, we are all ears. I'm hoping to share some of the adventure. By the way, this particular track is a real challenge due to fallen logs. I bent both mirage drives (hope I can straighten) and broke the sheer pin on the outboard. Had to tow my friends in paddle kayaks back to Kingston. Lovely spot and really enjoyed the adventure. Worked here on the iPad, Brian. Reminds me of the Everglades Challenge. It brought up my navionics page. Could not open the photos though. Here is my first track - maybe not what you were expecting! 6024kms of outback goodness! I had no idea Tony, there were so many creeks for your Island. Your legs must have been sore after doing over 6,000 kms. Worthy of a "gator tooth", eh? The most prolific road sign I saw was "Floodway", and I would dearly love to see what happens when it >really< rains out there. I am told that the heaviest rainfall was 67 inches in one hour, followed by another 39 in the following hour !!!!!). In the large gold-mning town of Broken Hill whole streets are shaped as hollow floodways. The most thought provoking permanent sign I spotted was in the area of Nyngan, which seems to get flooded every year "Helicopter flood evacuation assembly point". Gulp. I'm still here guys. Still miffed they pulled our Aussie forum. You now have a dishwasher in the new house and a spot for the Hobie. Why haven't you moved in? I have learned to like the US Hobie site. We get a much broader perspective and still have this forum for our Aus stuff.